The Light of Source, the One, contains all within itself, all polarities. As it proceeds into the Universe, it splits into two opposite polarities, masculine-feminine, action-reception, etc. The polarities are two sides of the same coin, they are always meant to be One, to be balanced, together they are the Light of One. Basically everything is made up of this. This is the meaning of the title and logo of this blog. This basic trangle, as it continues to multiply/divide, creates the seed of life, metatron's cube, and the flower of life. The Soul is pure Light and contains both polarities united. As it incarnates in lower planes it splits into two people/personalities of opposite polarities. This basic trinity is found in the kundalini, where the central channel is the Light of One coming from the Soul, which creates the other two, ida and pingala, which spin around it. It is also found in the trifold flame of the heart. Things multiply following a fractal pattern, which means that at each scale of creation we see the same pattern, the same basic foundation. We see it at the level of Soul family, we see it at the Soul level with the two twin souls, and we see it within each individual personality. This means that there should be 3 aspects represented in balance within each of us in inner connection with our Soul, and then manifesting outside in our relationships with the world. Inside prison Earth, this basic design has been incredibly attacked and manipulated by the dark, they do a lot of efforts to twist it in all ways possible, which interferes with the proper flow of Light manifesting in creation. Especially they interfere with inner balance of polarities within individuals and with creation of balanced relationships between people. The implant at the solar plexus in particular is designed for this purpose. 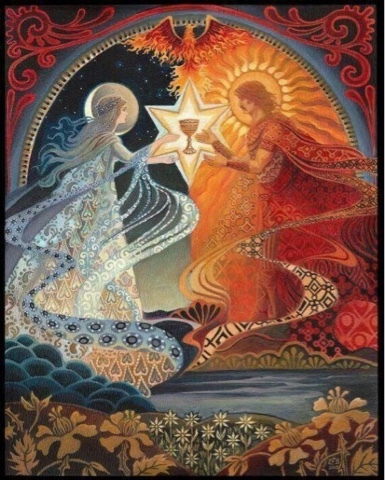 A healthy love relationship between awakened male and female, who recognize each other as Souls, connect with each other as Souls, and can bring this connected Soul energy between each other down into all bodies, mental, astral/emotional, etheric/plasma, and physical. This is especially powerful if they are soul mates and even more if they are twin souls. The relationship should not be based on exchanging trapped trauma/programming/personality based energies which connect with each other. It has to be the Soul presence connecting with each other. The Soul presence of Light is sent down in a pillar of Light which is the central channel of the body, which is connecting all bodies together, and then the two central channels of the two people connect together at all levels/chakras, which creates a powerful activation of Light, a portal which opens between lower and higher planes, bringing Light into the energy field of the planet. I know many Lightworkers have experienced huge amount of interference in trying to manifest this, and we got clear examples of this in recent events. So I want to bring more awareness about it out there to help resolve it, as everybody out there who can manifest at least some degree of this are helping to bring Light to the planet. I want to say a few words about the passing of Isis Astara to the other side. I am forever grateful for her anchoring divine feminine energies on this planet, during times where it is so needed. She was not so well known in public, but her work and influence had vast and vital effects on the planet. What I remember most of her is how dedicated she was (and surely still is, on the other side) to anchoring the Goddess energies on this planet. For her it was not just something different to try on sunday afternoon, or something to get personal power over others or recognition and approval. It was her divine purpose, to bring the balance back, for the liberation of this planet and all sentient beings. She has inspired me and countless others, she was working so much to keep anchoring the Goddess energies into the planetary grid and help stabilize and harmonize situations. So I want to put out this call, this reminder, to all of us, and especially other women and priestesses, we need to keep the Divine Feminine flame alive during these critical times on Earth that we are in. A huge cosmic cycle is ending, and a new one starting. Profound changes will come no matter what. The closer we get to the Breakthrough, the more everything will be compressed, pressurized, intense, and volatile. 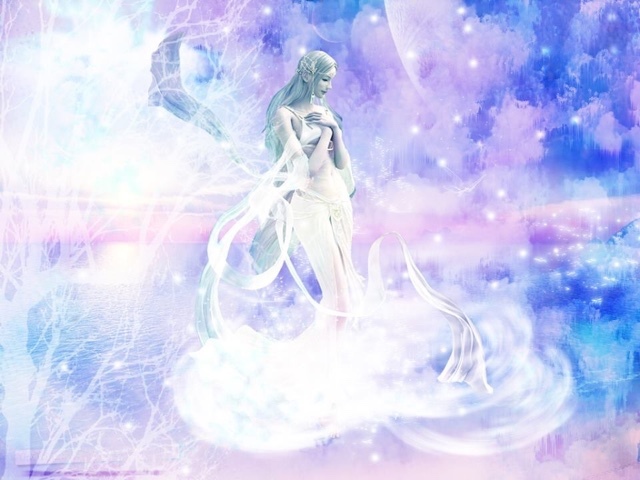 Goddess energy is and will be absolutely critical to help keep situations stable. We need to stop criticizing, stop projecting tension and negative perceptions, on others and ourselves. We need to be gentle with others and ourselves. Have Grace. Connect with our Soul, our I Am Presence, I Am power. Know that I Am always all the Goddess energy that I require. Know that I Am always the Divine Love that I require. Support each other. Radiate and visualize it everywhere, the pink Light ray of Cosmic Love. Connect and call the Goddesses, Isis, Tara, Durga, Quan Yin, etc. Let's keep the dedication, let's keep the flame alive. 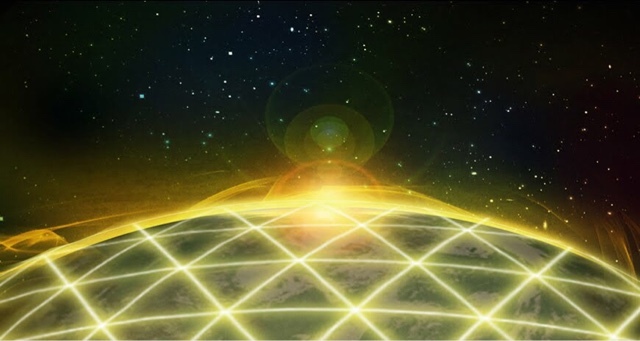 In order to strengthen the Light grid around the planet, as well as strengthen protection and harmony among Lightworkers, we can form triangle groups which will be connected together energetically from the Soul level. 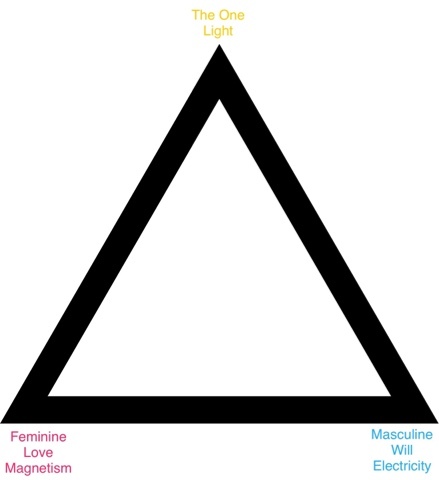 For this, first 3 people should know each other and be in contact with each other, physically and/or via internet, and all 3 should agree to form a triangle of Light. It is recommended if possible to have at least one man and one woman in each triangle. And then, do the meditation below, preferrably at least once a day, for at least 2-5 min. If you do it all at the same time it will be stronger, but you can do it in your own time also. It's better to form a triangle even if you don't do the meditation on certain days, or if you do it only for 2 minutes. 1. Bring your thoughts, emotions, energy field, physical body, into calm and relaxation. While you say it, visualize your Soul Star chakra getting brighter and bigger, and pouring Light down along your central channel. 3. Visualize a ray of brilliant white Light emanating from your Soul Star chakra and connecting with the Soul Star chakra of the other two members of your triangle, forming a triangle of Light within which Light is flowing. 4. Visualize a vortex of brilliant white Light pouring down from the Soul Star chakra, spinning down clockwise into the body and aura. Visualize this for yourself and the other two members of your triangle. 5. Visualize the Light of your triangle expanding around the planet, connecting with other triangles of Light and other points of Light throughout the planet, forming and completing a network of Light. Visualize other Light beings from above and below the surface of this planet, sending rays of brilliant white Light from their Soul Star chakras, connecting with our network of Light on the surface of this planet. You can replace 'Men' by Humanity, and 'God' by Source if you want. 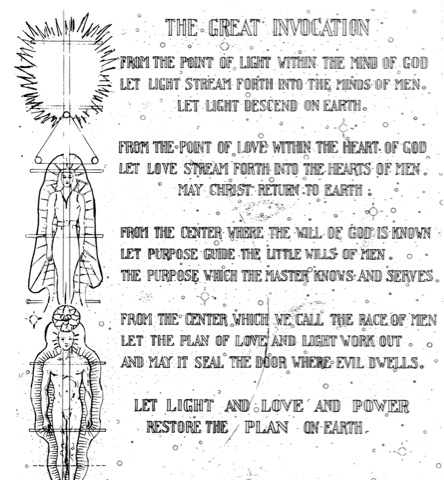 This invocation helps to bring Light from higher spiritual planes into the lower planes, and manifest the Event/Golden Age. 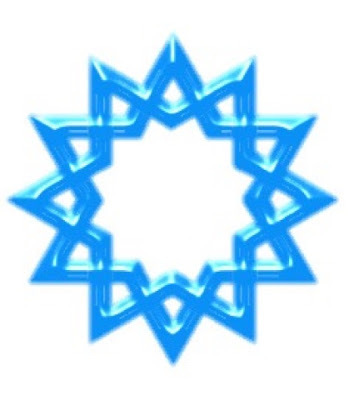 The Light of Soul Star chakra is an emanation of the Soul which is not really subject to personality distortions and therefore can be trusted and used to safely connect with each other. You can be part of several triangles at the same time if you want. You can also merge several triangles, forming a group of 12 or 24 people, when all of them know each other. Ideally, if possible, these groups will be composed of half men and half women. 12 groups of 12 people could also merge to form a group of 144 people. Through this process we can support and protect each other, learn to work together and connect together as Soul family more and more, and strengthen the Light on the planet.